By the end of the Battle of the Somme in November 1916 nearly 150,000 British and Commonwealth troops had died in the fighting. Behind such a stark number are a multitude of human stories; the true cost of the Somme, which British families bore in 1916. This photograph was taken at Hawthorn Ridge No 1 Cemetery, near Beaumont-Hamel, in 1919. 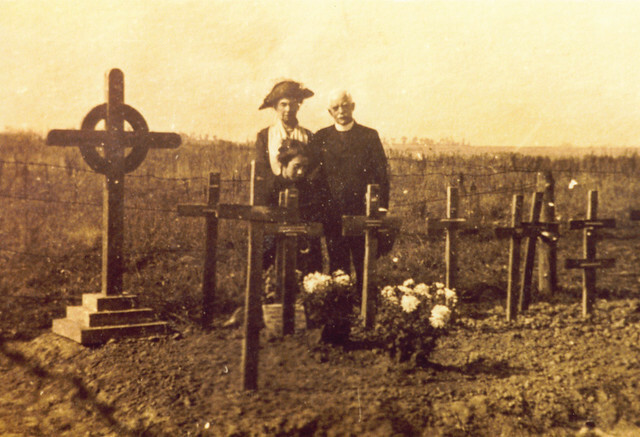 It shows the parents and sister of Eric Rupert Heaton by his grave, a simple wooden cross. The photo was taken by his brother, an army chaplain. Eric had died on 1st July 1916 leading his platoon up the slopes of Hawthorn Ridge; his body had not been found until the November placing him among the ‘missing’ and giving the family some faint hope he might have survived. On this 96th Anniversary of the Somme we should remember the sacrifice and the often forgotten achievements of the British Army in the Great War, but achievements always come at a cost – and this photo gives us a rare glimpse into what that cost really was for some families. This entry was posted on 01/07/2012 by sommecourt. It was filed under Battlefields, France, Great War, Somme, War Cemetery, Western Front, WW1 and was tagged with 1916, Battlefields, Hawthorn Ridge, Picardy, Somme, War Cemetery.